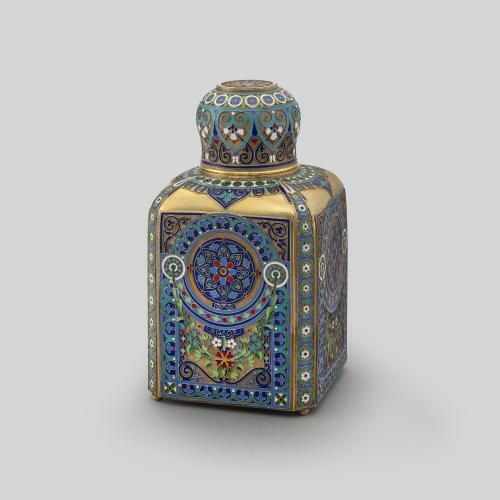 This tea caddy was made by Ivan Khlebnikov, a renowned Russian silversmith. It appears that he first opened a workshop in St Petersburg in 1867, before moving to Moscow in 1870-71. Khlebnikov’s Moscow workshop was large and productive, and he soon became Pavel Ovchinnikov’s main competitor in the production of pieces in the Old-Russian style. 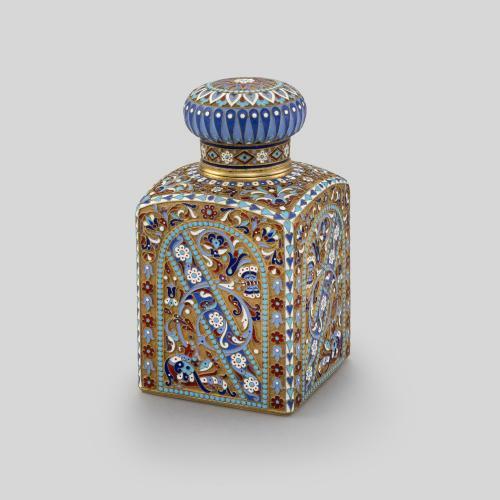 Traditional national styles in Russian decorative art were revived during the second half of the 19th century and traditional techniques such as cloisonné enamelling, used to create the patterns decorating this piece, became extremely fashionable. In 1872 Khlebnikov became the supplier to the court of Grand Duke Konstantin, and in 1875 received the Imperial Warrant.